Combustion of this manufactured product results in the emissions of carbon monoxide, soot and other combustion by-products which are known by the State of California to cause cancer, birth defects, or reproductive harm. Warning sticker on a box of Diamond matches sold in New York City. First, the amount of "carbon monoxide, soot and other combustion by-products" that results from the combustion of a single match seems very small, so small that it seems unlikely to cause cancer, birth defects, or reproductive harm. Second, the state of California has managed to impose its warning labels on consumers all the way on the other coast. Third, the rest of the package message is all about how environmentally responsible and wholesome the matches are: "greenlight," "sourced from responsible forests," "sources from responsibly managed Aspen forests of Minnesota. FSC certification guarantees that Diamond Greenlight Matches comply with strict socioeconomic and environmental standards of selective cutting regulations and land management." The cardboard box the matches come in is made of "100% recycled paperboard." Light one of these matches from the "responsibly managed Aspen forests of Minnesota" and the State of California predicts you are going to inflict cancer, birth defects, and reproductive harm on the surrounding victims? Fourth, imagine the cave men who first discovered fire were confronted with one of these Proposition 65 warnings. It is a scene out of some New Yorker cartoon, the prehistoric man with the club in his Flinstones-style garb huddled around a campfire ring reading the package: "cancer, birth defects, or reproductive harm...you know what, maybe we'll just shiver in the cold and dark and eat our food raw for another few thousand years." Fifth, the proliferation of these warning labels on relatively innocuous products seems more likely to inure consumers to the labels rather than to alter consumer behavior. I bought the matches and we will use them in the house, notwithstanding the scary label. But once even matches come with these labels, people may be less likely to pay attention to the warning labels on genuinely hazardous products like, say, cigarettes, or rat poison. Sixth, the label doesn't warn you of the more obvious risks of matches, like that you could burn yourself, or your possessions, by using them. The label focuses instead on the other risks that seem more remote. Seventh, the label focuses only on the negatives, and not on the positives. 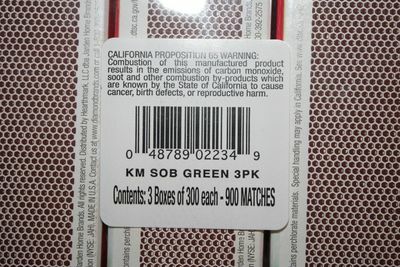 Maybe there should be a California Ballot Initiative requiring any product sold with one of these scary warning labels to balance them with some mention of the positive attributes: "These matches might give you cancer or cause reproductive harm if you light all 900 of them at once in a small unventilated closet, inhale deeply, and then sit on them, but if you use them the way most people do they might bring you happiness around a campfire or a romantic candle-lit dinner that will net out positively for your overall health." Eighth, the Jewish people have been lighting Sabbath candles on Friday nights for thousands of years. The idea that we are going to stop now because some public health bureaucrat in the state of California decides it's a public health emergency is just ridiculous. Ninth, I'm just a consumer. Imagine how the guy who owns or runs the match company feels about having to shell out legal fees and printing costs to slap this label on his product? For what it is worth, I am seriously opposed to cancer, birth defects, or reproductive harm. I don't take any of those three things lightly. And if there were some serious, peer-reviewed research out there that showed that lighting a single match once a week in a well-ventilated area led to statistically significantly higher cancer incidence or mortality than some other way of starting a fire or lighting candles, I'd certainly be open to the idea of modifying behavior. But the warning label doesn't tell that story. It tells some other story, one about excessive regulation or fear of litigation or a kind of paranoia that turns routine household products like kitchen matches into A-bomb-like deadly hazards.